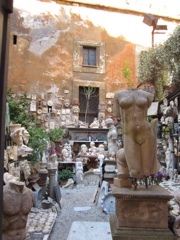 I spied this courtyard filled with antique statues on my way to Santa Susanna. It would have been lovely to take Venus or one of the busts home with me to adorn my ho-hum garden. How many interesting conversations it would have started! But I console myself that I didn't have to pay extra for excess baggage. These two turbaned gentlemen in orange robes sit here all day in perfect balance across from the Pantheon. One man holds the stick on which the second sits in mid air. Total concentration and control are needed to maintain this stance. Most importantly, how can they keep cool in the scorching summer heat? They must be thinking about winter! Yes, it's a pedal car but not for a child. I wonder if all the knock off bags and scarves hanging from the rack will be packed away in the back of this motorized tricycle? A smart car indeed!